Because it serves only a few homes, some assume the Pond Eddy Bridge is less important than bridges with higher traffic counts. But for the people who live on the Pennsylvania side of the river, it is vital as their only access to and from their home. 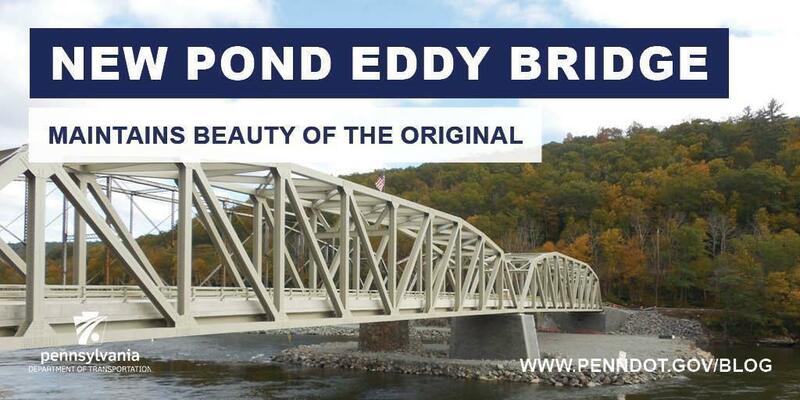 Built in 1903, the Pond Eddy Bridge is one of 10 bridges in PennDOT’s Northeastern District 4 that spans a river between Pennsylvania and New York. After more than 100 years of wear and tear, the old historic bridge had a weight restriction and required constant repairs and monitoring. Home heating oil trucks had to make many trips back and forth because a standard fuel truck couldn’t safely cross the bridge. The decision to replace the bridge thrilled the residents. The replacement project did present some unique challenges. The original bridge is on the National Register of Historic Places, which requires PennDOT to consider rehabilitation first. But rehabilitation was not possible to meet the transportation needs of the crossing. After many public meetings, it was decided to create a new bridge that resembled the original as much as possible. So engineers designed a new single-lane steel truss bridge. Crews also took extreme care to ensure the boating and tourism industry was not affected. In late October, after two years of construction, the new single-lane bridge opened. Though it may look like the old historic bridge, the new bridge is now both beautiful and functional.